This mother and child happen to be Princess Elizabeth and her firstborn, Charles, based on a Royal portrait by Marcus Adams. The stamp was issued in October 1950 and on sale until January 1951. 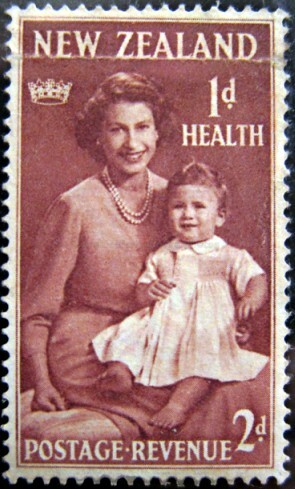 All proceeds from these health stamps were donated to the Children's Health Camps movement. These were first established as localized, seasonal camps for children to get "large meals, fresh air and gentle exercise" in 1919, and within 20 years had evolved into a national network of permanent camps. Today, there are still seven health camps on both islands, though their focused has shifted from fitness, malnutrition and tuberculosis, to include emotional well-being, behavioural problems, child abuse, and family dysfunction. Marcus Adams, who died in 1959, was known for his portraits of children, and photographed Queen Elizabeth with her daughters, the Princesses Elizabeth and Margaret, and later Princess Elizabeth with her children, Prince Charles and Princess Anne. I like the series of health stamps but haven't seen this one before. New to me too as are the portraits you mentioned. A great choice of theme for the letter M.